Chris - So, why would we want to sort nanoparticles out in the first place? What's the problem? Richard - Well there's sort of two main reasons you might want to do it. One is, when you're making the nanoparticles, often, you want to make a particular shape or size, but what the chemical synthesis produces is a spread of sizes and different shapes. So, if you could sieve them out, sieve out the ones you want, that would be really useful. The other thing is, as Matt was saying, if you're using these as sensors, sometimes you want to sort nanoparticles that have attached to something from the ones that haven't. And again, you could use this to sieve out the particles you're interested in from a more detailed analysis. Chris - And that's tricky to do at the moment is it? Richard - Yes, it's quite hard. Particularly, there are techniques where you can flow particles through and sort them into one bin or the other, but you have to look at every particle as it passes through and you have to do the detection very, very fast. It works on sort of droplets which would correspond to hundreds or thousands of nanoparticles. Chris - And of course, we want to use millions. Richard - Yes, but we want to sort them individually. So, both dealing with fewer at once and dealing with many, many more at once. Chris - Most people won't really grasp that you can actually light though in the form of lasers to push things around. So, how does your technique work? Richard - Yes. It uses the momentum carried by a beam of light. If I shine a laser pointer at you, it is actually pushing you backwards. There's energy flowing through the laser beam at high speed. And that corresponds to a little bit of momentum. But to give you a feel for the force, if I shine even quite a powerful laser at you, the force that exerts is less than the weight of a grain of salt on a table top by a factor of about a thousand. Chris - So, a very, very tiny force, but I presume with a very, very tiny particle you don't need very much force to start nudging them along. Richard - No, indeed. 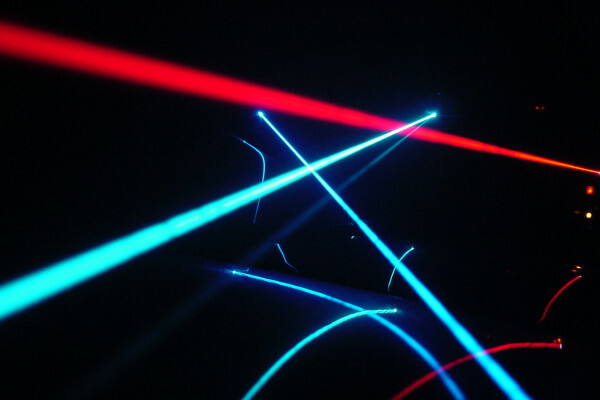 You can use a laser to push a particle. Well, what on those length scales, it's quite fast. Chris - So, how will your technique work? Talk us through what you're trying to do and how you're doing this? Richard - Well, I should start by maybe mentioning a bit more about how the light interacts with the nanoparticle. Matt said, it pushes the electrons around in the nanoparticle. But a nanoparticle, you can think of the electrons in a nanoparticle as the tea in you cup of tea. If you shake your cup of tea, it sloshes from side to side. But the size of your tea cup will affect the way it sloshes. A bigger tea cup will have tea that sloshes more slowly. Chris - Especially the cups of tea I drink, yeah. Chris - Because different coloured lights are different wavelengths. They have troughs and peaks which are different distances apart. Is that what you're getting at? Richard - Yes, exactly. And that corresponds to a different frequency. And so, if you have nanoparticles which resonate at different frequencies, what you find is that one colour of light will push one of those nanoparticles more than the other. Chris - So, by using different coloured lights, you can nudge one size of nanoparticle in one direction and perhaps another size in another direction or not influence it. In this way, you can achieve a sort of sorting. Richard - It has been shown. In the last couple of years, there have been a couple of papers where people have demonstrated that you get motion of nanoparticles of different sizes. What I'd really like to do is scale this up to many more nanoparticles at the same time. And then also, actually collect these nanoparticles. So, working in a microfluidic device. Chris - So for instance, if you wanted to use nanoparticles like Cameron was describing medically and you wanted a very, very tight specification for the particle, you could feed it through your system and it would literally be chucking one scale in one direction, one size particle or the rejects in another direction, a bit like the sort of nuts going along the conveyor belt and they get blown off by a puff of air if they're a pistachio that hasn't opened for example. Richard - Yes, that's what we'd like to get to. Chris - How far away? Chris - I presume it's not working, by the fact you're saying that's where I'd like to be. I presume you've still got a little way to go. Richard - Yeah, I mean, we've seen sorting of different sizes of nanoparticles but scaling it up will take a while. I wouldn't expect this to be used in products you can buy for at least 10 years or so, but in terms of using it for research in the lab, hopefully, that will be the next few years. Chris - But again, this is giving people an insight into the sorts of timescales that researchers work to where we don't have a light bulb moment and suddenly the problem is solved. This is a series of very, very painstaking experiments done in tiny increments of discovery over long periods of time. Richard - Yes, there's lots of things to tweak and optimise before we find the right conditions. Chris - Richard has brought some gadgetry along with him. So, you've got a little experiment for us here in the studio, Richard. What have you brought in? Richard - Matt mentioned earlier the Lycurgus cup. Which is a very beautiful piece of stained glass which looks green when you shine light onto it from the front and red when you shine light through it. Now given that we have various pots of gold nanoparticles in our lab, I've always been curious why I've never noticed this. So, I thought I would try and recreate the Lycurgus cup. Chris - So, you have stolen some laboratory nanoparticles for us. Can we see them? What do they look like? Richard - Okay, so this little pot here contains a small amount of kind of red liquid. It could well be cranberry juice although I wouldn't drink it. Chris - So, it is a pinky liquid and it is slightly what we'd call turbid, as in slightly cloudy but only just slightly. If I look at a screen behind it, I can see the picture on the TV screen behind it for example. So, there's lots of tiny gold nanoparticles in there. How big are the particles? Richard - So, the particles in here are about 50 nanometres in size. So, a thousandth of the width of a human hair. Chris - And what are we going to do with them? Richard - Okay, so if I shine a torch through them, you'll see that the torch beam looks kind of pinky. Chris - So, it just looks like you're shining a light on the solution does not look any different. It's the same pink colour I was looking at just now when I held it. Chris - You've now turned it around so that I'm looking along the beam of torch with it going away from me. So rather than seeing the light coming through the solution, I'm now looking along the torch, and seeing it hitting the front of the bottle. Richard - Exactly. And so hopefully, what you can see is a kind of greeny yellow tinge. Chris - It's a totally different colour. The light that's coming back towards me, what's reflecting off the front of the bottle is greeny yellow. I presume if I went around the back and had a look, I would just see pink light again? Chris - Why the difference? Richard - So, this is the way that the colour is formed. When I shine the light through, what you see is the light that isn't absorbed by the particles. Chris - So, that's the transmitted light so it just looks pink. Richard - When I shine the light on the front, what you see is the light that these particles scatter. As I was saying before, the resonance effect, this sloshing cup of tea, for these particles, 50, 60 nanometres gold particles, that corresponds to green light. So, it scatters the green light very strongly which is what you see when I shine the torch from the front. When I shine it from the back because that is the light that is scattered and absorbed, the red light gets through.